Nawurapu Wunungmurra, Wanyupini, 2017, Earth pigments on Stringybark Hollow log. Courtesy the artist and Buku-Larrgay Mulka Centre. Photo Tim Acker. People have always been connected. And now, the long history of interaction across cultures and civilisations is at risk of getting lost in the resurgent ethno-nationalism of the Brexit/Trump global order. This rhetoric echoes across Australia too. Western nations’ obsession with protecting their borders and retrenching multicultural aspirations in favour of assimilationist strategies is further evidenced in our reluctance to accept refugees. Mindless attacks in London and Barcelona earlier this year resulted in the unnecessary loss of life and further polarised opinion globally. Reactionary and populist politics have created a nationalist atmosphere based on fear and ignorance likely to negatively impact the lives of millions of Muslims worldwide, particularly the most vulnerable in places such as Syria and Myanmar. The current climate indicates an impasse that makes re-imagining transcultural relations imperative. In his reflection on Australia’s refugee policies during the Howard era, Nikos Papstergiadis discusses his belief that artist can "hold together competing, if not conflicting, claims on identity". (3) The transformative power of art lies in its potential to support us to imagine ourselves differently, allowing us to re-negotiate our relationships with each other and the world. The Art Gallery of South Australia (AGSA)’s biennial TARNANTHI: Festival activates arts and cultural venues throughout Adelaide to celebrate contemporary Aboriginal and Torres Strait Islander Arts. After opening in October 2017, TARNANTHI’s presence at AGSA continues throughout January 2018, offering audiences a glimpse into a way in which our collective identities might be enriched through art. Ricky Maynard’s photographic series Saddened Were the Hearts of Many Men asserts the "indomitable spirit of Aboriginal people". The artist invites audiences to "take that moment to really think about those pictures and look into the eyes and think about why this picture is made". Maynard's invitation can be extended to other works. Why were any of these works made and displayed? Ricky Maynard, Ben Lomond and Cape Portland people, Tasmania, born 1953, Launceston, Tasmania, Sean, from the series Saddened Were the Hearts of Many Men, 2015, Launceston, Cape Barren Island and Flinders Island, Tasmania, gelatin-silver photographs, 45.0 x 45.0 cm (image), 60.5 x 60.5 cm (sheet); Acquisition through TARNANTHI: Festival of Contemporary Aboriginal & Torres Strait Islander Art supported by BHP 2017, Art Gallery of South Australia, Adelaide. © Ricky Maynard. Art Gallery of South Australia, Adelaide. Photo: Sam Noonan. "The mark to disrupt, displace and dislocate the old and broken myth that Australia is, and was ever, a white country." 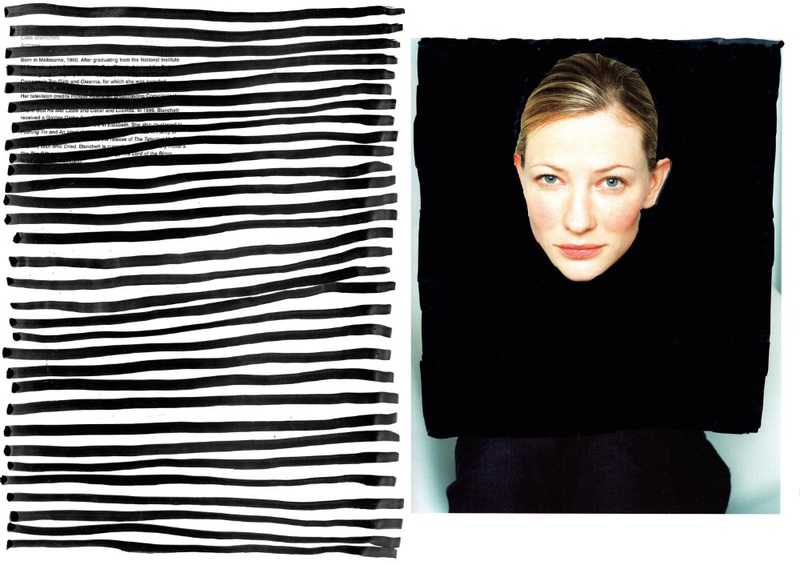 Dean Cross, Worimi people, New South Wales, born 1986, Canberra, Ngunnawal Country, PolyAustralis #19 (Cate Blanchett), 2017, Rozelle, New South Wales, archival pigment print on cotton photorag, 59.4 x 84.1 cm; Courtesy of the artist, original images by Polly Borland. Narratives that predate the dominant European presence in Australia are largely missing from the public imagination. The history of Islam in Australia precedes Christian colonisation and stands in stark contrast to the impact of the British colonisation. Aboriginal Australians sailed to Indonesia to trade tools and tortoise shells, and Muslim fishermen from the Indonesian city of Macassar made annual trips to Arnhem Land in search of sea cucumbers. Cave paintings in Arnhem Land depicting Macassan boats are speculatively dated back to the 16th century with traces of their cultural and religious legacy found in the song, dance and art of the Yolngu nation of the region. (5) The inclusion of Wanyupini by Nawurapu Wunungmurra in TARNANTHI pays tribute to this history. The ceremonial poles represent the coming of the wet season with clouds forming on the horizon. The Buku-Larrnggay Mulka art centre in the Yirrkala region on Northeast Arnhem Land says that "Yolngu sacred songs tell of the first rising clouds on the horizons – the first sightings for the year of the Macassan praus’ sails". (6) The geometric pattern can also be read as the sight of Macassan sails on the horizon that brought further cultural exchange. Whereas postmodernism emerged from high art theory, postcolonialism is based on issues of minority cultural identity and its initial focus on subverting the legacy of colonial hierarchical cultural identities with their inherent binary version of ‘us’ and ‘them’ that ‘others’ the non-western world. You, me, us, them, the new display of Australian Art post 1945 in AGSA’s Galleries 6, 7 & 17, goes some way towards helping us remediate relationships across difference. 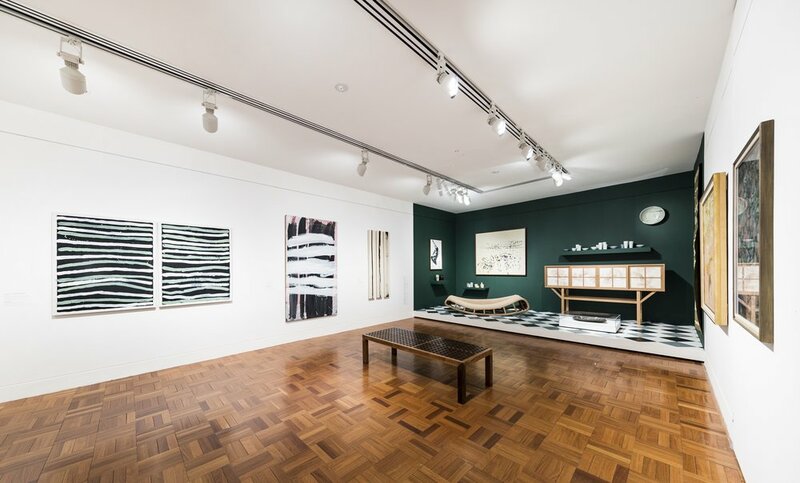 The understanding of history and lineage in Aboriginal art can present a curatorial dilemma for Australian art collections but this re-hang encourages connections that help us to re-imagine both personal and collective Australian identities. In just one example of this dialogue, Tony Tuckson sits alongside the sophisticated and timeless elegance of Emily Kame Kngwarreye. The display bears the marks of an identity in the making - an unsettling in-betweenness that mobilises the potential of art to re-imagine our shared cultural identity. Operating at the edge of the dominant culture is a precarious existence reliant on the interests and ambitions of the centre. It is imperative for us to repatriate the narrative of our nation to asserts the pre-existence of nations with songs and dreamings that tell the stories of this land long before white settlement. To properly address our past and make it possible to imagine a shared future, writers, curators, gallerists, and educators – the guardians of culture – need to have an appetite for change amidst the uncertainty and loss of power that might entail. Bertrand Russell, A History of Western Philosophy, (UK: Allen & Unwin, 1945), 268. Julie Drew, 'Cultural Composition: Stuart Hall on Ethnicity and the Discursive Turn', JAC, vol. 18, no. 2 (1998): 189. Yusuf Hayat recently completed a Bachelor of Art & Design (Honours) at the University of South Australia, Adelaide.